Plenty going on in the background at the moment on project Moongrunt – a fair few conversion sets (mixing various GZG bodies and backpacks – more on which later) but not much time to take proper photos so for tonight here’s some WIP of the first group from the NuCor Terraforming Company. These guys will fill a civilian and lightly armed slot in my games, possibly with support droids and couple of these vehicles from GZG. Maybe some sort of space bulldozer too. 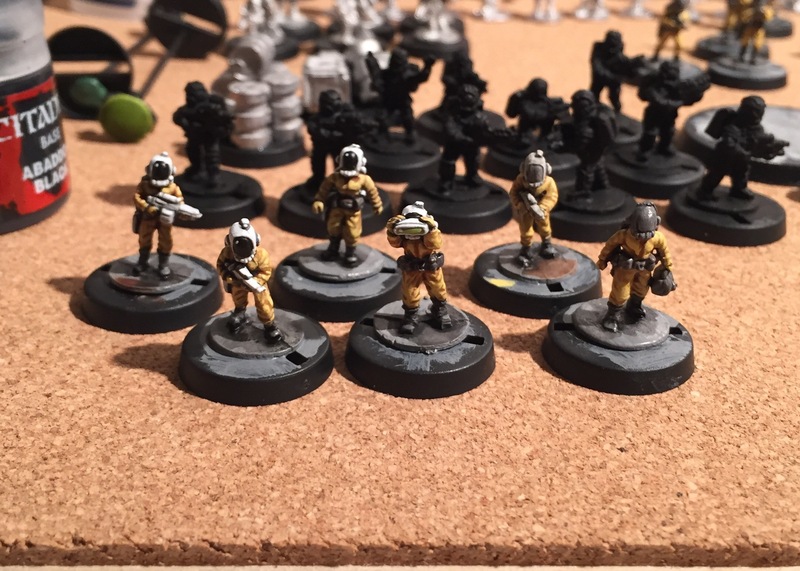 There’s 3 unarmed models in the full group, so they’ll double up as scientists or civilian objectives too – I tried to keep the uniforms a colour that gave them a corporate identity (my space setting involves clashing private enterprises and space-mercs) but also looks quasi-official. ‘Scuse the photo – must sort a lightbox. Bigger and better post to come on Sunday hopefully.